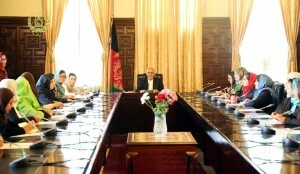 President Mohammad Ashraf Ghani has decided to appoint four female ambassadors to increase women’s role in government. President Ghani has said that as per the Islamic values he defends women rights. While meeting a number of female activists in presidential palace here in Kabul, President Ghani said that women’s right will never be sacrificed for peace. He said that appointing women in key government positions to include the posts of deputies and directors will be discussed next week. President Ghani says at the side of appointing four female ambassadors in the diplomatic offices of Afghanistan in foreign countries he also plans to appoint a female member for the council of High Court. President Mohammad Ashraf Ghani insists that he will also take steps in increasing women’s role in provincial administrations. Go Afghan girls go! The Afghan women’s contribution required to bring this country out of misery. By the way this comment is made by an Afghan man and don’t blame the women. This is, however, the truth! You have seen the intellectual capacity of Afghan men that is less than a monkey, when they lynched in Kabul the Afghan women Lady Farkhonda! She is 1000 time better and smarter than the mob of Afghan men, who actively participated and passively standing by and not preventing this horrendous crime. I am an Afghan man, but I am ashamed for the Afghan men. Even the current Afghan government boss including the its CEO are not able willing to challenge the status-quo and still the responsible people for Farkhonda killing are not prosecuted by laws of the land.